It doesn’t take a genius to declare American politics is broken. On one side you’ve got Republicans who are supposed to believe in limited government and individual liberty; on the other are Democrats, a party increasingly defined not only as the home of big government welfare spending but now harboring a growing inclination towards absolute socialism. As recent history proves voters tend to sway back and forth between the two extremes, putting one party in control until they get sick of them and then replacing that party with the other and the pattern is repeated over and over and over. Is there such a thing as a middle ground? Mark Penn wrote at Fox News, “More than 70 percent of registered voters say they want members of Congress to compromise and get things done, rather than stick to their principles and create even more gridlock. ‘Compromise’ may be a dirty word to partisans, but it is a golden word with the voters today. 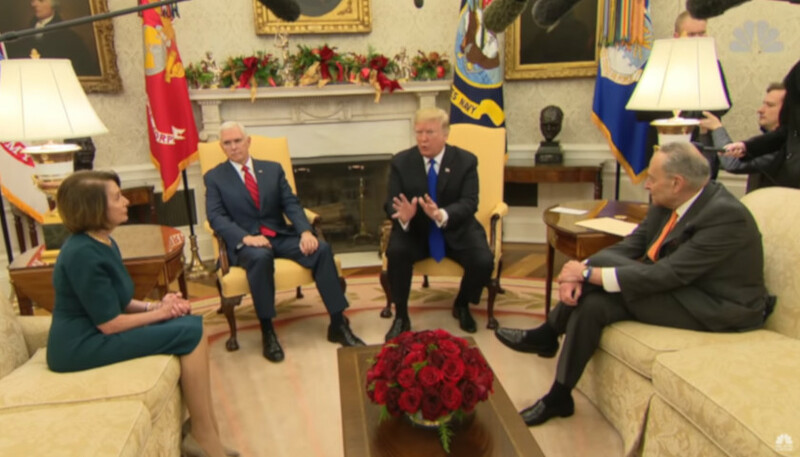 Watching President Donald Trump demand a wall, and Democratic Senate Minority Leader Chuck Schumer say Trump will never, ever get it, is exactly what the voters don’t want. We elected them to figure it out. Penn is a Clinton Democrat, so his advice should be taken with a grain of salt (but nonetheless, his columns usually sound reasonable). It’s becoming increasingly clear today that there’s no such thing as a “moderate” in the American political system. What, do some people truly hope for a one-size-fits-all federal government? If so, who decides on what to fund and what not to pay for? What is a priority and what’s not? What does “moderation” even look like? There are various political entities — and some politicians — who claim to embody the type of moderation Penn wrote so glowingly about in his piece. There’s the nebulous “No Labels” group made up of so-called middle-of-the-road pols from both parties who assert they’re for things like infrastructure and other good government measures everyone supposedly favors. Republican Ohio Gov. John Kasich ran his 2016 presidential campaign from the standpoint he’d bring people together to hammer out solutions to problems that’ve existed for decades. Contrary to Penn’s contention above, voters didn’t want anything to do with Kasich and his wishy-washy namby-pamby nothingness. Kumbaya hand-holding and rhythmic chanting is terrific for a church retreat but it don’t cut it in the world of cutthroat politics. And there certainly isn’t a movement among our fellow countryman to establish a new third-way party designated to push “compromise” legislation. Conservatives want to cut government and advance liberty. Liberals and Democrats want to grow government and force people to tolerate the “new normal” of transgender bathrooms and the LGBTQ agenda. What do “moderates” want? How do you bargain with thousand-year-old traditions and deeply held religious convictions? How would you divide freedom of speech? In a representative republic such as ours, people demand leaders who will go to Congress and the White House and battle like mad to do the things they were elected to accomplish. Democrats didn’t choose Barack Obama in 2008 because they thought he’d wilt when staring across the table from the “intimidating” figures of Mitch McConnell and gulp, John Boehner. Obama did nothing of the sort. The media presented him as a “moderate” but there was nothing compromising about the man. Government grew by leaps and bounds during his tenure; American sovereignty was abandoned in favor of international globalism and what was left of traditional social values were tossed in the politically correct dumpster to burn for liberals’ amusement. Obama legalized an entire class of illegal aliens with the stroke of a pen. His attorney generals led politically motivated witch hunts of his enemies. These are facts. What’s “moderate” about any of that? And what does it mean to compromise within the context of the federal government anyway? Seems to me that’s all Republican congressional leaders have been doing for years and it hasn’t resulted in improved feelings towards the GOP from about half the American public and especially those in the Democrat party. GOP leaders’ endless “compromises” also alienated a good many conservatives who became increasingly fed up with electing people who bend way too easily in the face of political competition that has zero qualms with holding out for everything they want, innocent people be damned. This latest government shutdown is a perfect example of Democrats’ stonewalling simply because they can. The House passed a bill (after the president threatened to not sign the previous capitulation), Mitch McConnell wouldn’t use his majority to force Democrats to end their filibuster and the media whipped the scenario that federal employees are starving at Christmas because of Donald Trump. The federal government has grown far beyond its constitutional limits due to a political class (in both parties) that seeks to buy control through federal largesse and a collection of judges who’ve shied away from striking down excessive executive and congressional powers. It isn’t a lack of accepting “half a loaf” that’s got us in the current mess, Mr. Penn, it’s compromising too much, jettisoning principles along the way. This biblical story assumes at least one of the women would care enough about the baby to give it up to save it. Is that true today? You would think Democrats “care” enough about the so-called DREAMERS to give President Trump the necessary money to construct the border wall and hence take real steps towards resolving the illegal immigration issue. But they don’t. Democrats toy with these unfortunate souls’ (supposedly brought here through no fault of their own, right?) legal status to preserve an issue to run campaigns on. It sounds good to the gullible portion of the American electorate that Trump’s an uncaring meanie who hopes to rid the nation of all brown people. Nothing could be further from the truth. Trump wants to reform the immigration system to encourage more educated newcomers, people who can financially take care of themselves, speak English, assimilate into the culture and in a short time contribute positively to the United States. Black, white, brown or yellow — doesn’t matter. Democrats want more voters so they can win the political war through demographic attrition. It’s not hard to recognize. It’s devilishly hard to compromise with an opponent whose naked political ambitions prevent them from coming to the negotiating table in good faith. You can’t “split the baby” when one side has no motivation to bargain either way. Even King Solomon would’ve been stumped. For those Democrats hankering for a new occupant of the Oval Office to foster “compromise” — or completely stifle it — there promises to be a wide-open selections process. DNC chairman Tom Perez wrote at the USA Today, “Democrats want to put our eventual nominee in the strongest position possible to defeat Donald Trump. This framework is focused on empowering the grassroots. We’re creating the most inclusive debate process in our history, and we’re going to be showcasing our amazing candidates and their ideas to as many voters as possible. “The DNC is announcing 12 presidential primary debates over the course of the 2020 cycle. Six debates will be held in 2019, and another six in 2020. The first two debates will occur in June and July of 2019, and the final debate is scheduled for April of 2020. Perez’s article jabs at the Republican debate formats from 2016, suggesting the first two 2020 Democrat debates will be held on consecutive nights and the candidates chosen at random (rather than having a main event and an undercard like the GOP settled on) — and determined not just from polling, either. According to Perez, “other measures” such as grassroots fundraising will be considered for participation, too. Doesn’t it all sound like a grand spectacle and a ton of fun? This framework probably means 2016 loser Hillary Clinton won’t run again. If she gets a bad debate draw and ends up standing next to some obscure idiot no one’s ever heard of it’ll decrease her stature with the rabid left. Why can’t she be placed right next to Bernie Sanders and Joe Biden — the three of them could gulp down their very own Geritol shake and drone on about their lifetimes of experience and how many free goodies they intend to give away! Simply stated, Hillary doesn’t have the stamina to do twelve debates. Sanders and Biden might not either. And Elizabeth “Pocahontas” Warren? She’ll be worn down from all the party powwows she’ll be attending. Does such a plan favor the young Democrat upstarts like “Beto” O’Rourke, Kamala Harris, Corey Booker and Kirsten Gillibrand? Time will tell. By the sound of Perez’s piece Democrats are pretty confident they’ll carry this year’s momentum into the presidential nominating cycle. Gone are the demons from 2016 — fixed results, superdelegates committed to one candidate before the process even starts, a party apparatus already in the tank for the establishment favorite, etc. It’ll be fascinating! Democrats’ biggest obstacle will be establishing issue distinction between the candidates. With a large field virtually guaranteed — and all of them basically in favor of the same things — how will anyone stand out? Biden will gush over his back slappin’ good ‘ol days with Barry O. in the Oval Office, Bernie will take all the credit for today’s pervasive hysteria on climate change and the young senators will declare pride at making Brett Kavanaugh cry on national TV. They’ll all laugh about how Republicans are racist, sexist, homophobic, xenophobic, anti-immigrant, hood wearing, wall building throwbacks to a bygone era. Republican primaries will be tame by comparison. Will there be a #NeverTrump challenger? RNC rules opened the door, apparently. David M. Drucker reported at The Washington Examiner, “President Trump is moving to protect his flank from potential 2020 primary challengers, seeking to defend against lax Republican National Committee rules that open the door for intraparty opposition that could frustrate his prospects. “Twenty months before the Republican Convention in Charlotte and more than a year before the first primaries, top Trump advisers have begun the process of establishing delegate slates that will ensure the president’s nomination for a second term. Trump’s team has been focused almost since he was inaugurated on creating the conditions for a smooth re-nomination. These fears are entirely unjustified. Barring some sort of catastrophic faux pas or sudden switch to pandering to the Democrats, no intra-party challenger to Trump would get far. Therefore, the primary season should be quiet on the Republican front and most states will concern themselves more with headlining races such as outsiders vs. establishmentarians for House and Senate nominations. The 2020 Republican convention will be most notable for its calm, boring nature when compared with the circus atmosphere in Cleveland four years earlier. A House member or two or a senator or two might “boycott” the Trump re-nominating Charlotte event but that’ll only be newsworthy to the chattering class. Trump won’t be embarrassed. In fact, he’d probably welcome a little primary competition to make things more newsworthy. He’ll get bored inventing new Twitter nicknames for the dozens of Democrat candidates, right?